Keeping the dog on a leash at all times when the introduction is to start, if the dog sees the cat keep them from barking, growling or lunging toward the cat. Reward the dog with treats or a favorite toy if he obeys. (NOT a squeak toy, this will frighten the cat.) 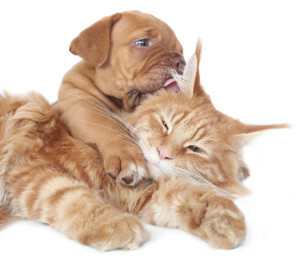 Don’t yell or scream at the dog for not obeying, this behavior will only scare the cat and the cat will associate your yelling and fear with seeing the dog. NEVER allow the dog to chase the cat, if this is allowed to happen, just one time, getting the two to accept each other will almost be impossible. Keep the dog on leash at all times until he sees the cat and does not get aggressive. The dog generally just wants to play and chase the cat. The cat on the other hand associates this behavior with aggression and fear, and will want to get away. After the basic training is mastered, it is time for a face-to-face introduction in a controlled manner. Wearing a training collar and a leash, give your dog the command to either “sit” or “down” and “stay”. Reinforce compliance with food rewards. Have a family member enter the room and quietly sit down with the cat on his lap, at first the cat and dog should be on opposite sides of the room. 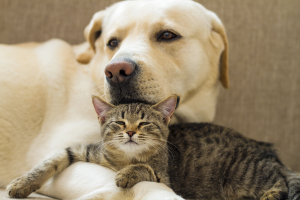 Repeat this step several times until both the cat and the dog are tolerating each other without signs of aggression or fear. Don’t restrain or hold the cat against their will, this will only frighten the cat further and they will associate the fear while being around the dog. If the cat wants to escape, let them and try the introduction at another time. If after you accomplish this step you can move on, but not until all is calm. 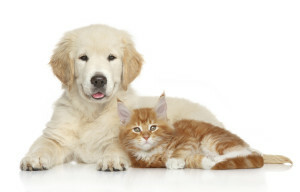 Next, move the animals closer together, with the dog still on the leash and the cat gently held in a lap. If the cat does not like to be held, you can use a wire crate or carrier instead. If the dog gets up from his “stay” position, he should be firmly repositioned, and praised and rewarded for obeying the “stay” command. If the cat becomes frightened, increase the distance between the animals and progress more slowly. It must be on the cats terms.